One of the last Saturday Sweets of the year is dedicated to what seems to be the ultimate dessert of 2018 — over the top milkshakes. If you’re looking for a larger than life dessert in Fort Lauderdale, make your way to the newly opened BRGR Stop. It’s the second location owned by Michael Buchinski, Mark Haig, and Devin Cahow. 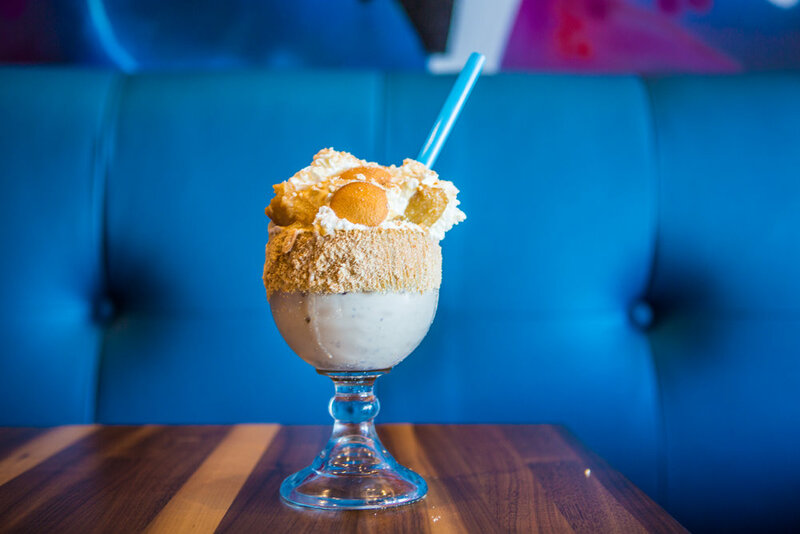 The second BRGR Stop has one deliciously big difference — adult twists on childhood favorites such as spiked shakes and floats. These boozy milkshakes come in a variety of flavors making it hard to decide on just one. Some of the menu’s fun concoctions include: the Swinging Ape, rum, banana, praline ice cream, peanut butter and Nilla wafer rim, caramelized bananas and Nilla wafers; Strawberry Shortcake, with vodka, Liqueur, Fruity Pebble milk, strawberry ice cream, strawberry jam and shortcake rim, topped with Fruity Pebble whipped cream, Fruity Pebble cereal, Twizzlers and Shortbread cookies; and Mint Condition, with whiskey, Jägermeister, chocolate syrup, mint chip ice cream, chocolate syrup and peppermint dust rim, whipped cream, thin mints and mini Jager bottle. To make the experience just a bit more extra, the milkshakes are served out of a separate bar that’s been built inside a 1968 Ford cargo van. Keeping with the fun theme of nostalgia, the menu also features rotating seasonal flavors. Winter milkshakes include Peppermint and Bourbon Eggnog. If you’ve got a big appetite, pair your milkshake with one of BRGR Stop’s 18 crazy burger creations. Like the Fu-Get-About-It, 10 oz. BRGR blend combined with Bella Roma’s meatball mix, San Marzano tomato sauce, and mozzarella cheese on a garlic butter toasted bun; the 2016 Riverwalk Burger Battle Fan Favorite, Peanut Butter Jelly Time, is made with peanut butter, tomato jam, cheddar cheese and candied bacon; and Mac Daddy, jalapeño Havarti cheese, jalapeño cheddar, sausage mac and cheese, root beer sriracha BBQ sauce and candied bacon; or the Ay Papi, a 50/50 chorizo and beef blend, fire-roasted poblano pepper, proper habanero bacon, Manchego cheese and poblano lime aioli. 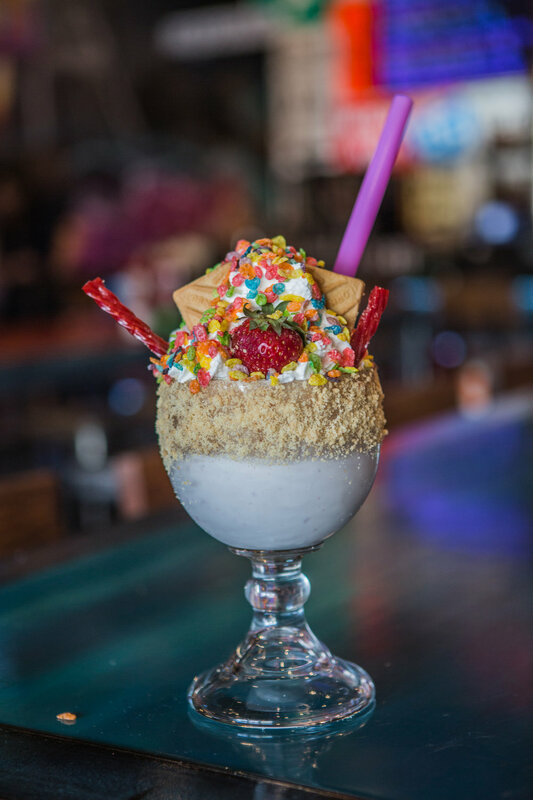 Next time you’re looking to satisfy a serious sweet tooth craving, make your way to BRGR Stop for one of their seriously delicious over the top milkshakes.